How to start an export business in Iran? What are the certification formalities to export to Iran? How to get export licence in Iran? What are the procedures for registration as an exporter in Iran? 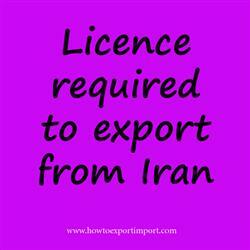 This post explains about export registration procedures to be obtained from Iran government authority to export from Iran. If you need to export goods or services, a onetime registration procedure is being completed in most of the countries. Such export licence may be obtained from concerned government department if required in Iran. The import and export of goods in Iran, on a commercial basis requires a commercial card which shall be issued by Iran Chamber of Commerce, Industries and Mines and approved by the Ministry of Commerce. Licensing procedure to export goods to a country is almost same worldwide. Detailed information on how to obtain a licence to export to a country is explained in separate post in this website. Click below to read the same. The details given here explain about export registration procedures to be obtained from Iran government authority to export from Iran. Export registration procedures required in KISH ISLAND. Export Licence process in BANDAR KHOMEINI. Process to export to BANDAR ABBAS . Requirements of registration to export to Tehran. Registration requirements in Tabriz to export. Registration needed to export to Shiraz. How can I register to export in Qeshm. What Licence requited to export in Mashhad. What should I do to export goods in Mehrabad. How to get export licence in Tehran. Procedure to get registration to export in Mashhad. Mandatory process need to complete export in Mashhad. Firstt permission required to export in Kish Island. How can I start export business Isfahan?. How to begin export trade in BANDAR KHOMEIN? Permission to initiate to export in BANDAR KHOMEIN. The way to get registration to export in Kish Island. Ravi Garg: On 31 July 2018 how to export India to Iran? How to export from India to Iran?